Mary Jo Maynes — Schooling in Western Europe. A Social History. Bonnie G. Smith — Confessions of a Concierge: Madame Lucie's History of Twentieth-Century France. Michelle Guitard — Histoire sociale des miliciens de la bataille de la Châteauguay. Allan M. Brandt — No Magic Bullet: A Social History of Venereal Disease in the United States Since 1880. Joe William Trotter, Jr — Black Milwaukee: The Making of an Industrial Proletariat, 1915-1945. David Harvey — The Urbanization of Capital. Michael R. Marrus — The Unwanted. European Refugees in the Twentieth Century. Denys Delâge — Le Pays Renversé. Amérindiens et Européens en Amérique du nord-est, 1600-1664. Richard Charles Murphy — Guestworkers in the German Reich: A Polish Community in Wilhelmian Germany. Clare Gittings — Death, Burial and the Individual in Early Modem England. Norman P. Zacour and Harry W. Hazard, eds. — The Impact of the Crusades on the Near East. Volume Five of A History of the Crusades, ed. by Kenneth M. Setton. K.N. Chaudhuri — Trade and Civilisation in the Indian Ocean: An Economic History from the Rise of Islam to 1750. J.F.C. Harrison — The Common People of Great Britain: A History from the Norman Conquest to the Present. Lorna Jane Abray — The People's Reformation: Magistrates, Clergy, and Commons in Strasbourg, 1500-1598. Kenneth J. Rea — The Prosperous Years: The Economic History of Ontario, 1939-1975. 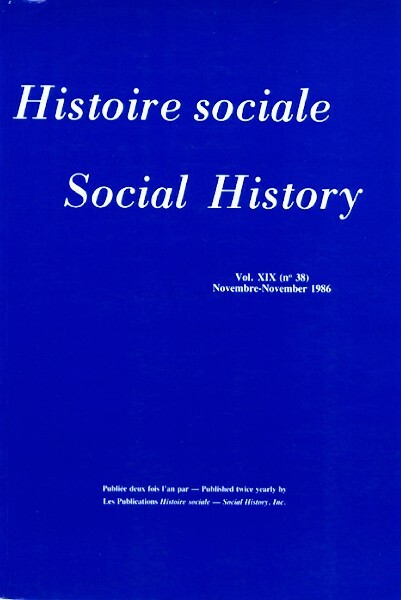 Edward Berenson — Populist Religion and Left-Wing Politics in France 1830-1852. Geoffrey Crossick and Heinz-Gerhard Haupt, eds. — Shopkeepers and Master Artisans in Nineteenth Century Europe. Ian M.G. Quimby — Apprenticeship in Colonial Philadelphia. Steven Hahn and Jonathan Prude, eds. — The Countryside in the Age of Capitalist Transformation: Essays in the Social History of Rural America. A.L. Beier — Masterless Men, the Vagrancy Problem in England, 1560-1640. Charlotte Fuhrer — The Mysteries of Montreal: Memoirs of a Midwife. David R. Colburn — Racial Change and Community Crisis: St. Augustine, Florida, 1877-1980.